The starting date and time plus roughly the time that you want us to collect the bikes. Bare in mind that we can't deliver the bikes earlier than 9-9:30 if you are in west or east Crete due to driving distance (we need in some cases 3 hours one way to get there). Bare in mind that terrain in Crete is very steep and you will need to be very fit if you are planning a long route. You can solve this by renting one of our e-bikes. 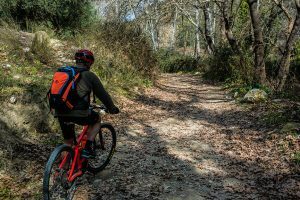 We are the first company in Crete that we offer the latest e-bike MTB (mountain bike) with the new Bosch system & 500w battery. Click here to download the manual and operating instructions for the Bosch system in case you are not familiar. It is however very simple, just 4 speed scales and two more buttons that can show various settings in the monitor (distance, speed etc). 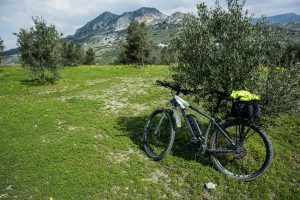 Our e-bikes are 2017 & 2018 models all from the German company Cube, a highly respected cycling company in Europe with excellent quality. 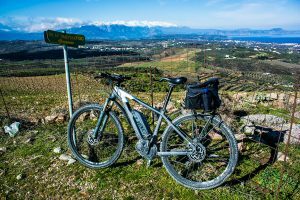 Crete has very steep terrain and with the e-bikes you will enjoy more the landscape and cover much faster distances. An evening ride of 60km in 3 hours with 1500+ meters of ascent/descent is possible. No more complains from the family staying the whole day in the hotel awaiting you to come back from a long day route. We also rent a few full carbon road bikes from GIANT and mountain bike from TREK as listed on this page. All ebikes come with SPD pedals compatible with Shimano system. You can use them however without SPD shoes in case that you don't have as the one side of the pedal is flat, suitable for any kind of sport shoe. 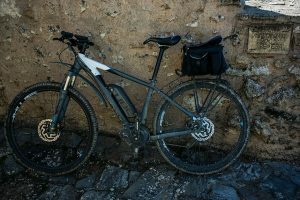 Cube 29" MTB Hybrid with Bosch system and the largest 500w battery. Suitable for up to 60km or more with just one charge. Giant SCR3 full carbon road bike with LOOK compatible pedals. You are welcome to bring your own pedals if you want compatibility with different system (Shimano etc). Trekk 29" hard tail mountain bike fitted with rear rack with or without road tyres. These bikes do not come with SPD pedals. The cost is regarding Chania region, that means west Crete. The cost is 100€ per delivery and another 100€ to collect the bikes. Of course you are welcome to get the bikes from our warehouse without paying extra. The cost is regarding Rethymno region, that means more or less central Crete. The cost is 80€ per delivery and another 80€ to collect the bikes. Of course you are welcome to get the bikes from our warehouse without paying extra. The cost is regarding Heraklion region only the north part. The cost is 50€ per delivery and another 50€ to collect the bikes. Of course you are welcome to get the bikes from our warehouse without paying extra. For delivery and pick up in the south part of Heraklio region you will need to add an extra 50€ (total 150€). The cost is 80€ each way only for delivery to the north of eastern Crete and no further than Pachia Ammos village. That cost cover the villages/towns of Elounda, Plaka, Agios Nikolaos and Ammoudara to name a few. For delivery to the further north or east or south add 50€ to the above price (total 210€). Just type in Google Maps "Enjoy-Crete" and will point you exactly where our warehouse is to pick up the bikes. You can also use the map on the right on this page to navigate or click direct Our Warehouse. You will need to contact us before the rental day in order to arrange for someone to open the warehouse as we do not have staff all day there.